The iPhone takes pretty good pictures as is, but you can make your photos look even better by using the built-in Auto-Enhance tool. It’s not an overwhelming effect by any means, it’s more of a subtle boost to contrast and saturation, which generally makes the picture look closer to how it would be seen in real life. With some photos you will barely notice a difference because auto-enhance can be very subtle, but with others it gives pictures a nice pop in color and contrast. With some images the changes are almost impossible to notice, so don’t think you will get Instagram-like adjustments out of this. 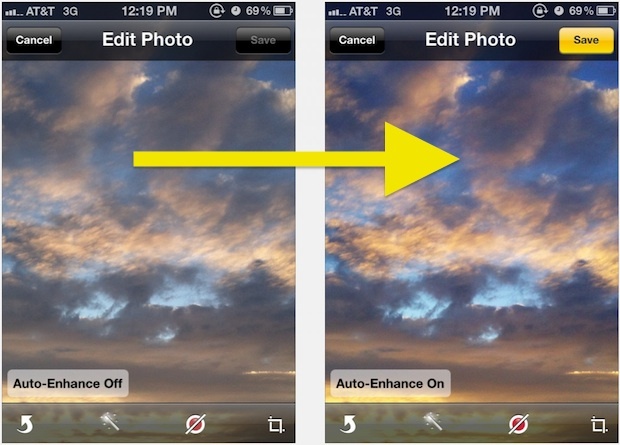 While in the Edit menu you can also rotate images, crop pictures, and even remove red-eye. There’s no way to turn this on automatically for every picture so you will have to use it selectively. Technically the feature works on an iPad and iPod touch too, but for most of us the iPhone is what we snap pictures with on a regular basis. It looks to me like it increases the black levels slightly and nothing more? When you use auto enhance it makes the resolution of the picture worse. The picture goes from 8 megapixels to .7 megapixels. I’ve noticed the smaller file size after using auto enhance. I also don’t like using the Auto Enhance as it decreases the resolution of the photos.